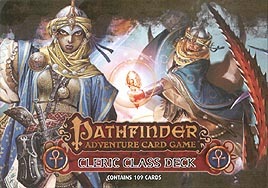 Bring your cleric to temples at home and abroad with the Pathfinder Adventure Card Game Cleric Deck! Explore four different cleric archetypes in this 109-card set, from Kyra the healer to Heggal the carouser. The Cleric Deck boasts new spells, items, and other loot to take your character from the beginning to the end of any Pathfinder Adventure Card Game Base Set, or Pathfinder Society Adventure Guild Organized play campaign. Pray on!